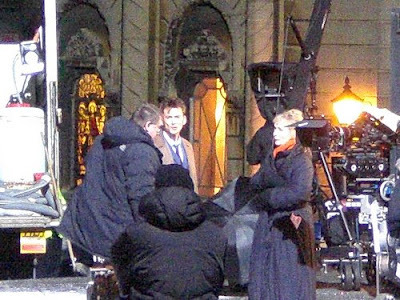 More filming for the Doctor Who special (Episode 4:16) is taking place tonight (Friday 27th) in Victoria Place, Newport. 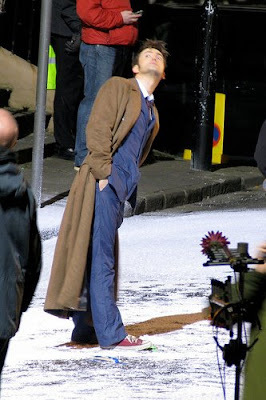 The residents of Victoria Place have been told to expect snow and Christmas decorations so we're obviously looking at the 2009 Christmas Special here. 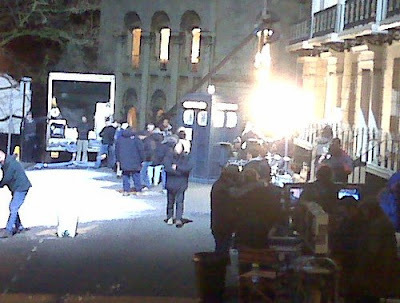 Filming starts at 10.00pm I believe, and the TARDIS prop is already in situ in a street dusted with visual effects snow. Images courtesy of Ahremsee's Flickr Photostream (thanks to Rob) and from Alun Vega's Flickr stream too. Updates will keep coming as filming starts. 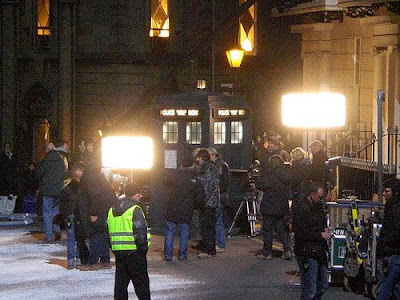 All the usual DWF reporting crew, including Scooty and the gang, are all converging on the shoot so this post will keep updating as we go through the night. 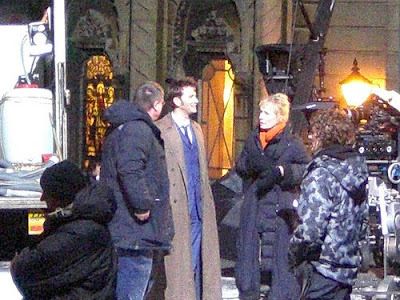 Ahremsee has just reported that David Tennant and Lindsay Duncan are now on set and interacting with a large silver robot and several other travellers. 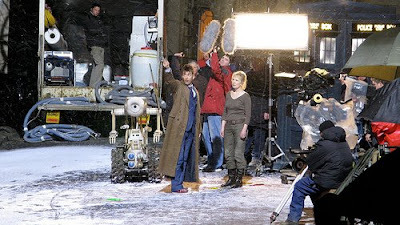 Tennant is on set and they've brought out a crash mat. 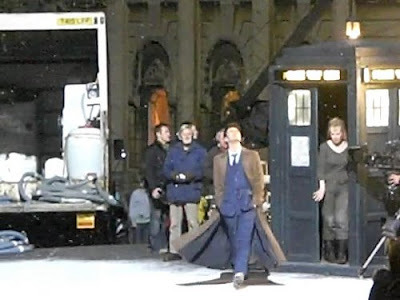 He's wearing the blue suit, by the way. Danny 'Explosions' Hargreaves has been spotted on set. Some pyrotechnics later perhaps? 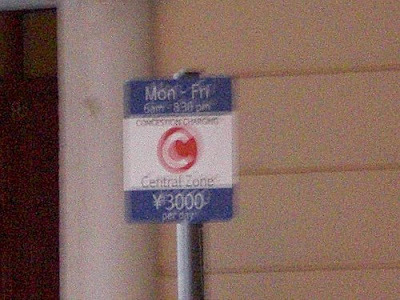 "this is a congestion charge zone with fines of 3000 yen"
"low emissions zone, hydrogen powered vehicles only"
It looks like Duncan gets a trip in the TARDIS and here you can also see the caterpillar tracked robot 'thing' that was spotted during filming a few days ago. 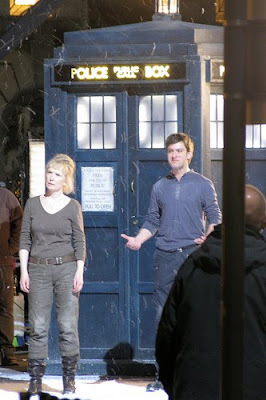 Plus two unidentified characters, a young girl and a man. 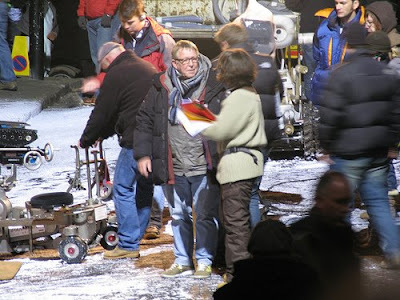 David watching the snow fall and the guvn'r, director Graham Harper, clearly relishing the madness of location filming. 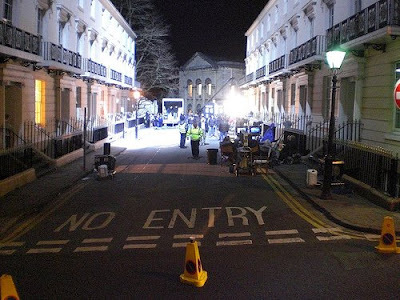 The crew broke for supper at 23.30 and filmimg resumed until 04.00am. What times we live in, I'll grab a beer and watch events unfold! Going to be a slow night. Should start getting further reports and pics after the supper break. 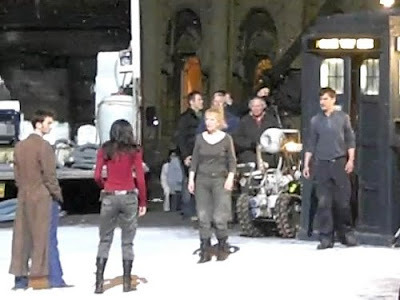 Looks like they're spending Christmas in the future for once. Good.